I live in Taebaek. Seoul is 3-4 hours away. Chuncheon, our provincial capital is about 3 hours away. Daegu, 3rd largest Korean city is about 3 hours away. Taebaek is the middle of nowhere. Sometimes we need to get away and have our dose of western goodness. These days we are turning to Daegu more. Why? Its closer than Seoul, we can drive there, its like “mini Seoul” and it has Costco. Major added bonus is this place. 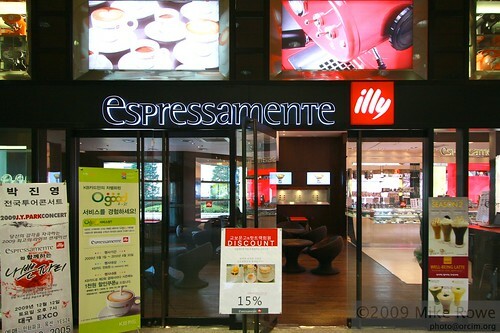 We’ve been going to Daegu for a few years now, and about a year ago discovered Espressamente Illy. 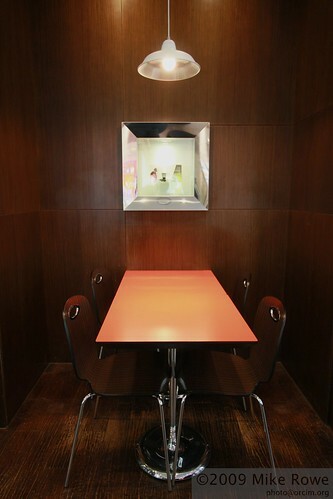 Think of one of the most modern and funkiest coffee shops anywhere in the world, then put it in downtown Daegu. Its an amazing place. 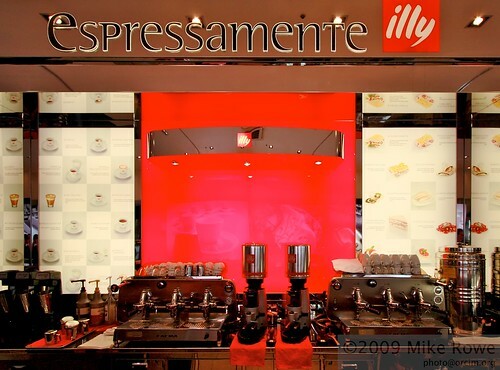 I know Illy associate themselves with design and fashion and this place is no exception. 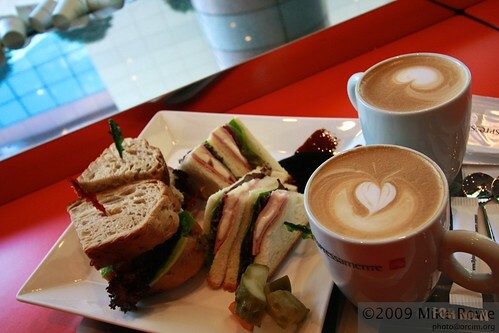 Delicious delicious coffee’s, amazing cakes, awesome sandwiches. Hard to beat (actually there is one place better, but its in Seoul). 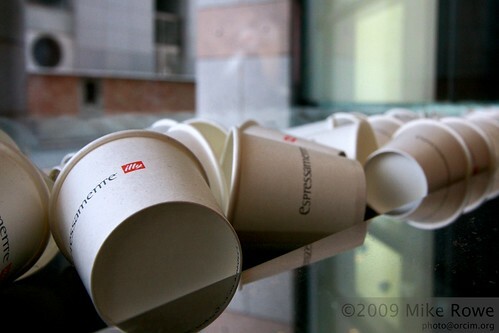 Yes, its expensive, but so is every coffee shop in Korea. What you see above was W19,000 and worth every individual won. 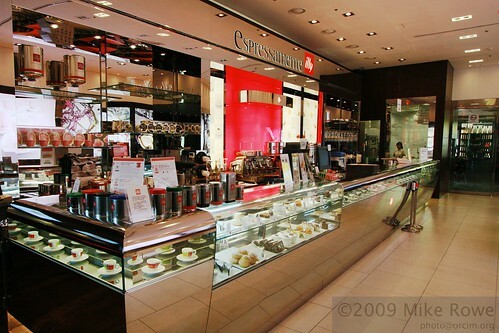 Its perfect coffee with the milk steamed to perfection, the sandwiches are freshly made, with (by Korean standards hard to find) fresh ingredients. Finally, we have discovered that a long standing rumour is true. Yes, they are real. Really real. Yes indeedily, they are geniune Obama Socks. Now you’ve seen everything. Only in Korea could you possibly find a treasure such as these, and all for about $1 Australian too. W50,000??? Wait, that can’t be right, $1 gives you $50? The amazing W50,000 pair of socks. Some of the most valuable socks ever to be seen in the back streets of Daegu. On topic (barely), the new W50,000 notes are a godsend. Finally you can carry a reasonable amount of cash with you without needing a huge wallet stuffed with cash. Amazing when you consider that the W10,000 note was introduced in 1973 and so was the top valued not for over 25 years. It ended up being worth about US$10 or so. Please note, that picture is old. My hair now in no way resembles what you see in that picture.